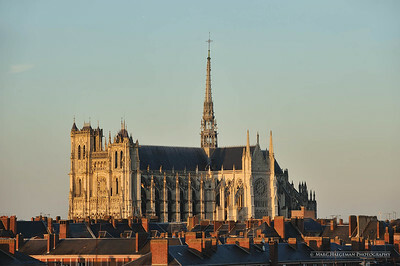 As a large vessel in a sea of roofs the Notre-Dame cathedral dominates the skyline of Amiens. 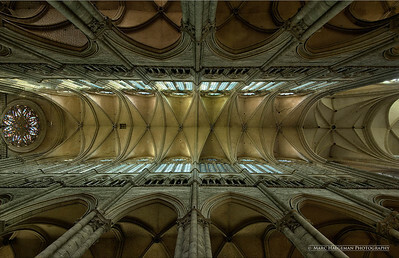 145 m long and 56 m high, with an estimated volume of 200,000 cu m this is the largest gothic building in France. 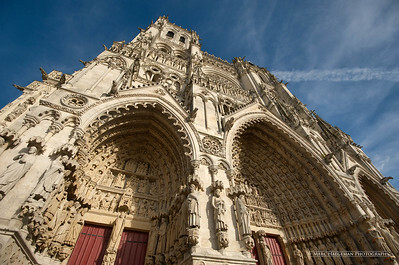 The spire reaches 112,7 m.
The west facade of Amiens presents a highly elaborate and coherent medieval iconographic ensemble. While several different artists must have been at work here, the three portals show remarkable homogeneity. The central portal depicts the Last Judgement and is stylistically the most individual. 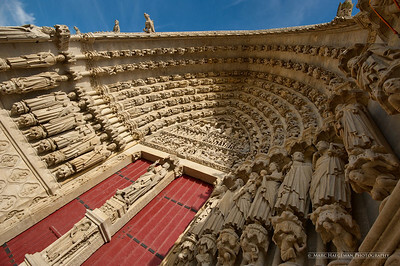 The right portal is dedicated to the Virgin Mary, in a more sketchy, hieratic style, while the left honours the local saints, in particular Saint-Firmin - allegedly the first bishop of Amiens - and doesn't hide its stylistic lineage with Paris. The middle portal (1220-1235) displays a dazzling ensemble of sculpture, thematically centred on the Last Judgement. The tympanum depicting the actual judgement is elaborated in the voussures with angels, souls of the redeemed carried by angels, the damned, martyrs, confessors, holy women, the Elders of the Apocalypse, the Tree of Jesse and Old Testament Patriarchs. 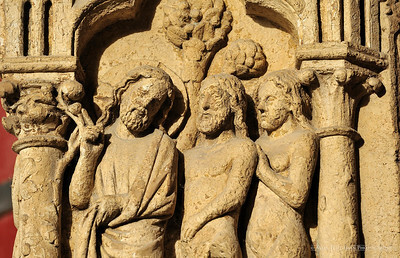 Christ and his Apostles appear on the trumeau and jambs, bordered by Wise and Foolish Virgins, while vices and virtues are shown on the quatrefoils. 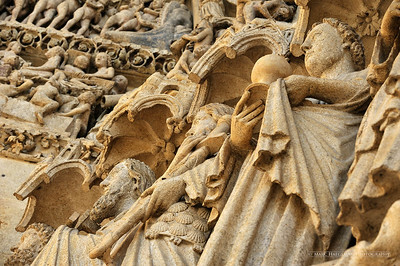 The decapitation of bishop Firmin as shown on the trumeau at the left portal of the west facade. 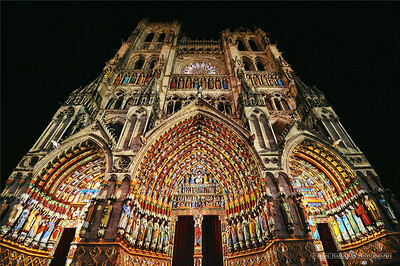 After arriving from Spain the bishop brought many locals in Amiens to the christian flocks, but was incarcerated and executed at the beginning of the 4th century by the local authorities. His martyrdom generated a true cult in medieval Amiens, reflected by many works in the cathedral. The nave effortlessly reaching a height of 42,3 m, epitomizes the triumph of 13th century gothic architecture, or how audacity meets perfection. 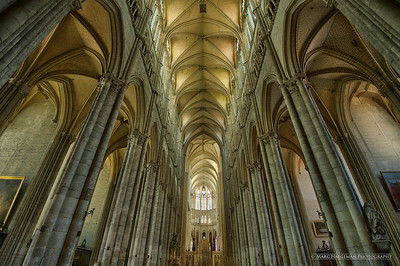 Begun in 1220 by Robert de Luzarches, the nave was completed in 1236; the choir by 1269. 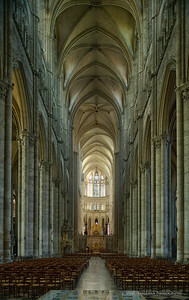 While following the three-story elevation seen at Chartres and Reims, the emphasis on height changes the whole appearance of the interior. Only 14,6 m wide, the nave presents a relation of 3:1 between height and width, creating a vertical thrust which was unseen at the time. 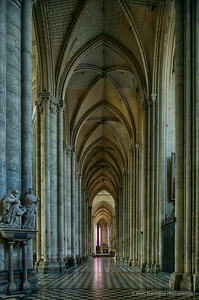 The aisles are no less impressive with a height of 19 m - which is almost as high as the nave of Wells Cathedral. The elevation of the aisles gives the piers a far lighter and slender appearance than ever before. 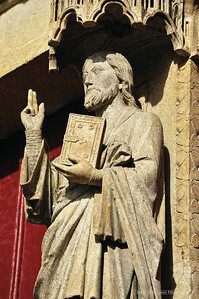 The cleaning campaign of the cathedral's west facade in 1992-99 revealed the largely intact polychromy of the portals and shed new light on our understanding of medieval iconography. The common sombre, greyish appearance of our church portals turned out to be vividly coloured ensembles, reflecting a totally different approach of decorative painting. Each evening during the summer months a projection of HD digital images allows to relive the cathedral in all its original polychrome glory. 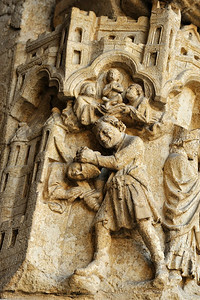 The decapitation of bishop Firmin as shown on the trumeau at the left portal of the west facade. After arriving from Spain the bishop brought many locals in Amiens to the christian flocks, but was incarcerated and executed at the beginning of the 4th century by the local authorities. 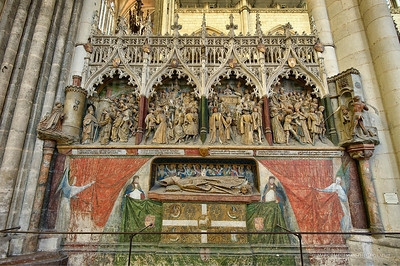 His martyrdom generated a true cult in medieval Amiens, reflected by many works in the cathedral.